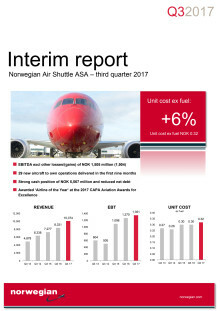 Norwegian (NAS) today reported its third quarter results for 2017. 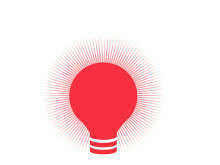 The net result was 1 billion NOK (£94million), an improvement of 4 per cent compared to the same quarter previous year. The load factor increased to 92 per cent. The passenger development has been positive in all of Norwegian’s key markets, with a significant growth in the U.S. and Spain. The third quarter was characterised by strong international passenger growth and a high load factor, as well as fleet growth- and renewal. The company carried 9.8 million passengers, an increase of 14 per cent compared to the same quarter previous year. The US and Spain reported the highest increase in number of passengers, 79 per cent and 25 per cent respectively. The load factor increased to 91.7 per cent and the capacity growth (ASK) was 25 per cent. In total, 10 new aircraft entered the fleet, whereof 4 Boeing 737 MAX, 1 Boeing 737-800 and 5 Boeing 787-9 Dreamliners. A new and modern fleet of aircraft combined with a high load factor reduce emissions per passenger kilometre. In the third quarter, the total emissions per passenger kilometre was reduced by 2 per cent. Norwegian’s total revenue this quarter was 10 billion NOK (£940million), compared to 8.3 billion NOK the same quarter last year. The company has strong liquidity with 5.6 billion NOK (£526million) in cash at the end of the third quarter. 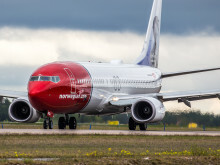 Norwegian’s CEO Bjørn Kjos said: “I am pleased with the passenger growth and high load factor this quarter. During our 15 years in the skies, almost 210 million passengers have chosen Norwegian. An increasing number of passengers in the US, Spain and other parts of the world considerably contribute to the growth, which proves that our global strategy is being realised. During the quarter, Norwegian launched 14 new intercontinental routes, including Singapore, Denver and Seattle as new destinations. 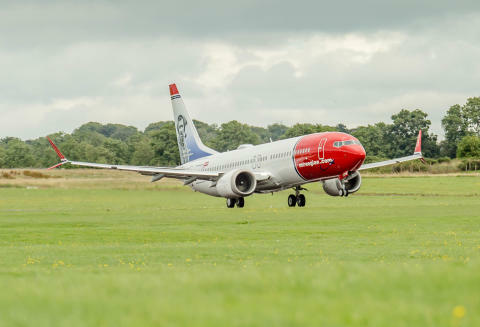 Other highlights included the company’s British subsidiary, Norwegian Air UK, receiving a US Foreign Air Carrier Permit and the launch of a partnership with easyJet. Together with UNICEF, Norwegian conducted a humanitarian aid flight with a brand-new Dreamliner, carrying aid for 300,000 children in Yemen. This is the fourth humanitarian flight in four years.